As soon as you get close to Old Salem’s C. Winkler Bakery, you're hit with an incredible aroma that gets your mouth watering before you set foot into the building. 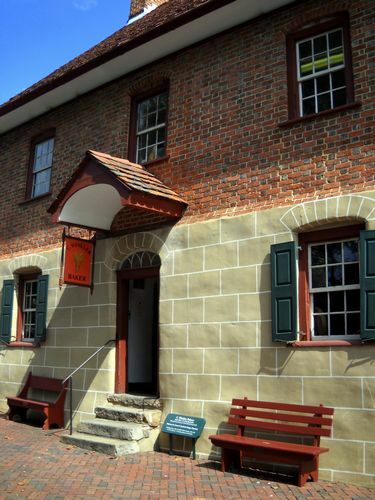 Built in 1800 to serve the Moravian community in Salem, North Carolina, this historic bakery is now a favorite stop on the Old Salem Museum and Gardens Tour. 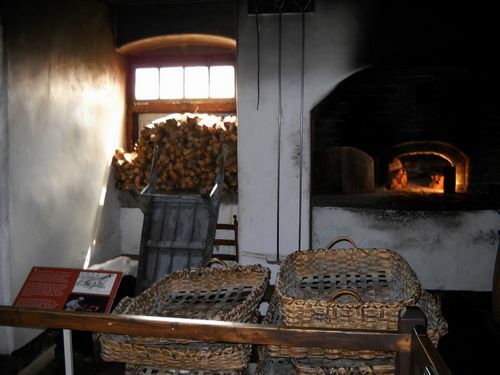 And rightfully so, as bread and sugar cookies are still made from scratch six days a week from recipes based on the Moravian originals, baked in dome ovens heated with wood, just as they did two centuries ago. Listed as a National Historic Landmark, the Old Salem Historic District of Winston-Salem showcases the culture of the Moravian settlement during the 18th and 19th centuries. Seventy-percent of the buildings are original, making this area unique. The remaining buildings have been re-created. Visitors can tour the area and enter the buildings where costumed performers re-enact life as it was at that time. The Moravian Church, a Protestant denomination, first began in 1457. Bethlehem, Pennsylvania and Winston-Salem, North Carolina were the north and south headquarters for the early Moravian settlers in North America. The Moravian community bakery was originally operated by Thomas Butner, who eventually decided that he would rather be out in the fields than baking inside. It was taken over by Christian Winkler, who came to North Carolina from Pennsylvania. To this day, the baked goods are made with fine ingredients, following authentic Moravian recipes. The result is a delicious product that isn't overly sweet, much like bakery items found in parts of Europe. Moravian cookies are a popular item at the bakery. These super-thin wafers come in a variety of flavors, most notably sugar and ginger. Bakery customers can buy them loose or packaged in cans. The cookies, and other items from C. Winkler can also be ordered online through the Old Salem web site. The ovens are not running on Sundays, but the bakery is open to the public with many yummy items to choose from.